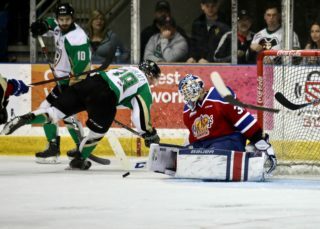 RAIDER REVIEW: The Prince Albert Raiders (7-23-1-1) take on the Moose Jaw Warriors (18-7-4-1) for the second time in five days at Mosaic Place tonight. 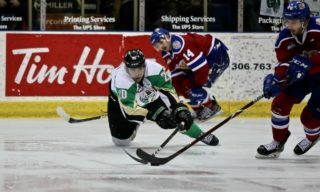 On Tuesday night, the Raiders edged the Edmonton Oil Kings 4-3 in overtime at the Art Hauser Centre. 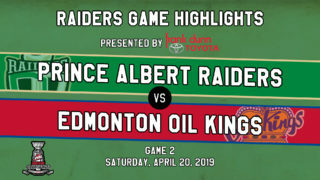 The Oil Kings opened the scoring early in the second period on Lane Bauer’s 22nd goal of the season, but the Raiders responded with two goals late in the period. Nick Heid’s first and Cavin Leth’s eighth gave the Raiders a 2-1 lead after 40 minutes. In the third, Aaron Irving tied the game at the 3:58 mark. Less than three minutes later, Drew Warkentine put the Raiders ahead 3-2. However, Will Warm scored with 5:23 to play to send the game to overtime. In the extra period, Austin Glover gave the Raiders the win with his 10th goal of the campaign. Ian Scott earned his sixth win of the season for the Raiders, stopping 32 of 35 shots faced on the evening. VS. MOOSE JAW: This is the fifth of eight meetings between the Raiders and the Warriors this season and the third of four at Mosaic Place. This is also the fourth game in the month of December between the East Division rivals. MAKING HIS MARK: It took a while, but Raiders defenceman Nick Heid has the first goal of his 105-game WHL career after scoring during the second period of Tuesday night’s game against the Edmonton Oil Kings. Lately, Heid’s offensive contributions have started to show with three points in his last four games. 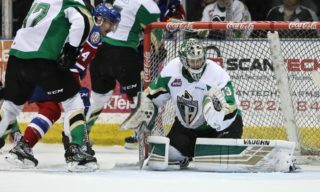 NEW CAREER HIGH: Cavin Leth has been one of the best Raiders at putting the puck in the net this season as he is currently tied for third on the team in goals scored. With a goal in back-to-back games, Leth set a new career high for goals with one team in a single season with eight in this campaign. During his four year WHL career, Leth has scored 29 goals in 222 games. BACK IN THE LINEUP: Raiders forward Kolby Johnson is eligible to return to the lineup tonight after serving a four-game suspension for a checking to the head major penalty and game misconduct given to him in a game against the Regina Pats on Dec. 3. SHOOTOUT DEBUT: In the last meeting between the two teams on Saturday night, the Raiders ventured into a shootout for the first time this season. Last season, the Raiders went to the skills competition four times, finishing with a 3-1 record. NEXT UP: The Raiders travel to Swift Current for a Friday night clash with the Broncos at the Credit Union I-Plex. Game time is 7 p.m. The next Raiders’ home game is on Saturday night when they host the Broncos in the second half of the home-and-home series. 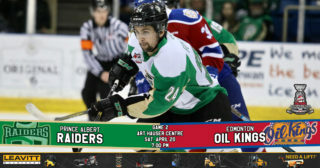 Puck drop is 7 p.m. Tickets are available at raiderhockey.com, at the Raider Office or by calling 306-764-5348.